If you know me, you know that I’m a sucker for Ireland. I’ve always said that eventually I’d like to settle down in the most remote and beautiful Irish countryside that I can find. It’s a country that’s all about beauty in all aspects, be it the people, the land, or the beer. Imagine the look on my face when I discovered Montague’s Mount, then. A horror game set on a remote island in Ireland had me sold on the concept already. Now imagine the look of disappointment as I played the game. Montague’s Mount finds you washed up on a deserted beach on an abandoned island off the coast of Ireland. After finding a makeshift walking stick, you set off to find out if the island you’re on is really abandoned. 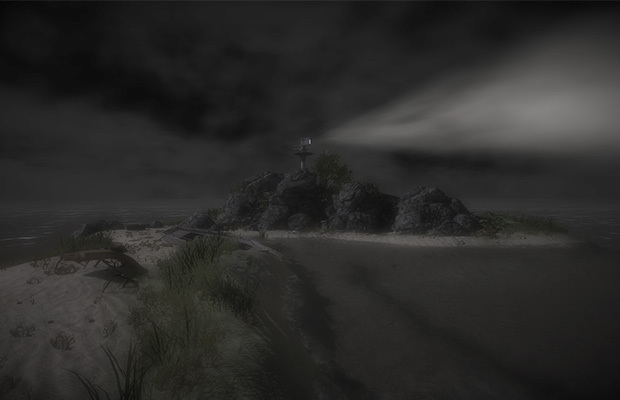 The game’s creator states that the game is influenced by the movies Shutter Island, One Flew Over the Cuckoo’s Nest, and The Blair Witch Project, and you can see that inspiration in spades. But the main downfall of Montague’s Mount is that the story is too vague to care about–especially coupled with puzzle design that is equal parts intricate and frustrating. What made Gone Home so impressive was that each object you uncovered gave you further insight not into just the character, but the overall story. More importantly, it made you care because the very few puzzles in Gone Home were relative to the game’s narrative. In Montague’s Mount, puzzle design comes from the 90’s point and click adventure game school of thought, and not in a good way. The first puzzle has you backtracking, collecting objects (usually hidden in darkness), trying to interpret vague clues, and converting Morse code. I walked one kilometer before finishing the first puzzle. I know this because the game popped up a big “Achievement Unlocked” notification, which did nothing but break immersion. The game’s puzzles never feel relevant to the story it’s trying to tell. It lacks the finesse of other, more worthwhile experiences that this game tries to emulate. Montague’s Mount does earn points, though, by implementing the Gaeilge language, which is the only game out there to do so. Praise should be given to the game’s audio. The haunting and minimal score really does add a lot to the game. The sound design is where this game really shines. The usual bumps in the night are thrown out in favor of truly replicating the sound of an abandoned island off the coast of Ireland. The creaking of floorboards and the hum of an electric generator all blend in naturally with the sound of the waves and distant sea lions. It helps to remind you that a place like this actually exists. A good vocal performance from Derek Riddell gives the player’s character some life. With a deluge of great independent horror titles out there, it’s hard to recommend Montague’s Mount to anyone. The game’s over-reliance on intricate yet unintuitive puzzles, backtracking, and a vague and un-intriguing story, Montague’s Mount is best forgotten. Montague’s Mount was developed by Polypusher Studios. A digital copy of the game was provided for review purposes.